The following case is from a patient I saw in my office in Orange, CT who lived in Woodbridge, CT. I personally completed this case and documented it with photographs throughout the process. It ended with a successful outcome. 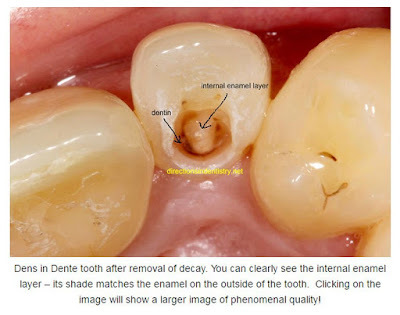 Dens in Dente, also called Dens en Dente or Dens Invaginatus or translated literally as “Tooth Within a Tooth” is a dental condition that develops during teeth formation in which the outer surfaces of the tooth become folded inward, resulting in what appears on dental x-rays as a small tooth growing inside the middle of a large tooth. This happens most frequently on the crown of maxillary (upper) lateral incisors. Treatment and tooth prognosis are always unpredictable due to the highly variable anatomy. I have personally seen dozens of patient with absolutely no dental decay in their mouths except for one tooth – a tooth with dens en dente. This patient, a 36 year old male with no significant medical conditions, presented for a comprehensive dental exam and radiographs. His last visit was over 5 years ago. He avoided dental care due to fear. On clinical and radiographic exam, there were findings consistent with dens in dente on tooth #10 – maxillary left lateral incisor. I tested the tooth to insure vitality and it responded normally.